The R26DT Ranger tire changer is a professional‐grade, high capacity, double tilt tower changer designed to handle a wide variety of tires and wheels, from stock OEM’s to high performance alloys and OTR’s—all with tender care. 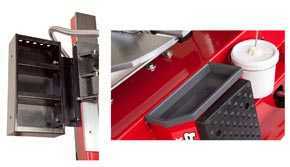 You’ll be amazed at how much the R26DT Tire Changer can do for your business. Probably the biggest concern of our customers over the past 17 years has been - How long will it last? That's where the R26-DT comes in. These machines are the lastest and greatest products from Ranger that incorporate all of the high-end features from top manufacturers, yet they are surprisingly affordable. They were made not only for the start-up auto shop and full service garage. They are also suitable for high volume tire shops as well. Go ahead. Use them and abuse them. They will stand up to the abuse. They were made to hold up to everyday use - day in, day out. Constructed with heavy duty components so you won't be out of commission 6 months after the warranty expires. And specialized too. 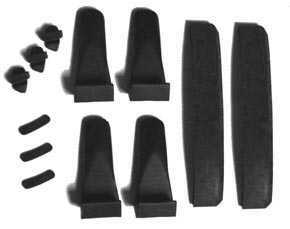 You'll be able to tackle those stubborn, hard to change wheels, like thicker wall tires, and low profile wheels. Controls are all conveniently positioned to maximize productivity, and Ranger doesn't take any shortcuts. 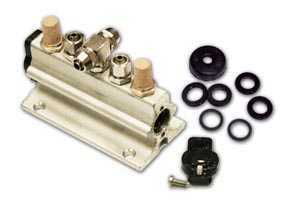 All components are industrial quality, leading to longer service life and less down time. And just check out the capability of these machines. 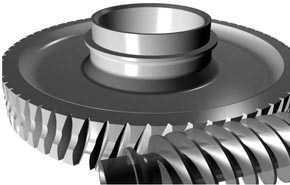 They can handle a wide range of rim / tire diameters. Any shop owner would be proud to own one. 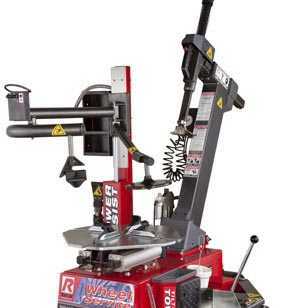 When you want a durable tire changer that will service pretty much anything you can throw at it, including the big, expensive wheels, as well as the low profile tires that are so prominent today, the R26-DT is what you want. 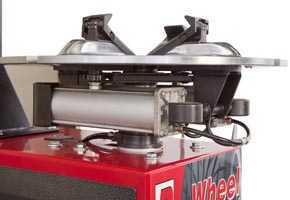 If you want to take your tire shop to the next level, you need a machine like this. The power assist mounting helper arm aids in changing those expensive performance tires that most of your competition cannot. 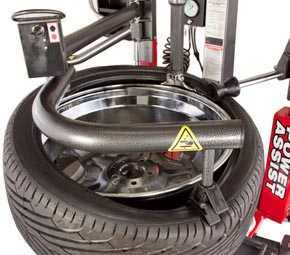 Stubborn thick walled tires are a breeze with the state of the art precision features that this machine offers. Plus, the additional second right side power assist arm really turns it up a notch.  This second arm will allow you to expand your service offerings even more by handling run flat tires. NextGen tire changers include electric turntable drives that are high torque, with more power than most and faster speeds and reversable, so you can remove tires quicker and easier. The NextGen tire changer's specially designed and shaped tabletop allows for easier lubrication and also provides easier access to the underside of the table for inspections at maintenance. 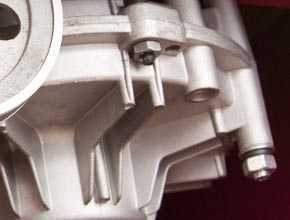 A powerful 2 HP motor is at the heart of all Ranger tire changers. 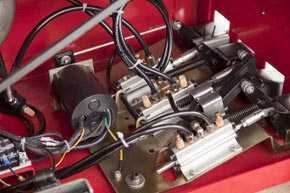 Most machines only come with a 1.5 HP motor, or sometimes even less. 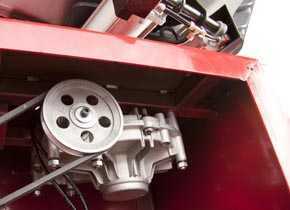 Copper rotors and premium ball bearings provide for more reliability. Insulated with thermal epoxy for heat dissipation. 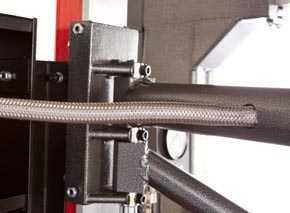 Frame consists of rolled steel for rugged durability and less flex. Drive belt is specially engineered to be convex so as to reduce wear and cords are protected with a sheath that is resistant to wear, oils and solvents, and abrasion. Flywheel is balanced ensuring that this tire changing machine will run smoothly for years with less vibration, which means you won't have to repair or replace it as soon as others. All tire changers are built standard with a maintenance free gearbox that dissipates heat better than most machines due to the large grease and oil reservior all to provide for greater longevity. 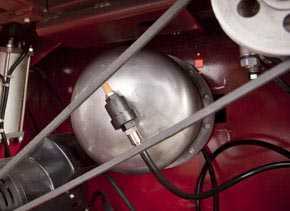 A pneumatic accelerator is added to all Ranger tire changers to allow for speedy bead breaking in both directions. The NexGen tyre changers feature a multiple axis bead breaking blade that is also adjustable, so it can be set at numerous angles to be able to handle a wide variety of wheel sizes. The innovative TurboBlast™ system for seating tire beads is probably the most effective system found on any tire machine on the market. 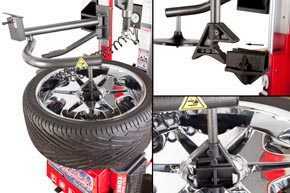 Shoots a rapid blast of air that mechanic can set at any desired angle bead seating system on your new NextGen™ tire changer is capable of blasting a powerful air burst between the tire and rim to help seat stubborn beads fast. 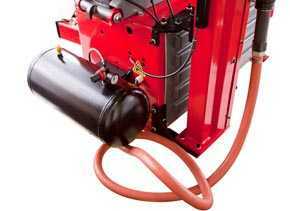 The Ranger TurboBlast system has a discharge hose that is nylong to prevent damaging expensive rims and has a tab that grabs the rim to prevent slippage and aid in control when blasting the air into the tire and wheel. 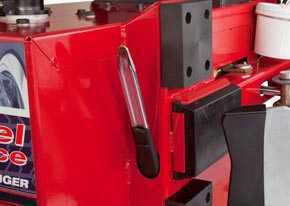 The NextGen tire machine arm that breaks the bead is comprised of durable box frame construction that creates rigidity and strength and reduces that chance for flex, bending or warpage. Soap bucket with brush and all other standard accessories are included. 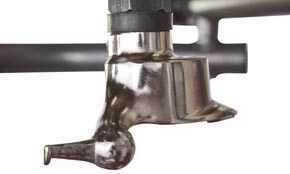 Tire Changer Bead breaker axle will not fail due to flex or breakage due to it's large double flanged construction. Expect years of reliable service. 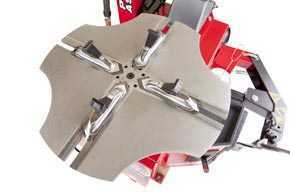 All Ranger tire changer components are premium quality with no shortcuts. 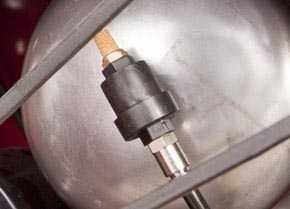 The cylinder for the bead breaker is stainless steel assuring that corrosion won't be a problem. All pneumatic control valves are fabricated with precision machined and die cast bodies of aluminum and zinc and are industrial quality to reduce the possibility of failure. 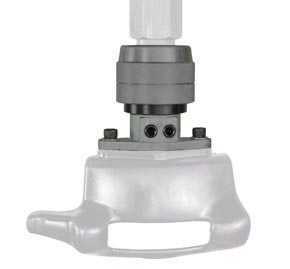 Most importantly, the pneumatic control valves are rebuildable and contain are fitted with the finest grade polyurethane seals and self lubricating piston guides that are made of Teflon. 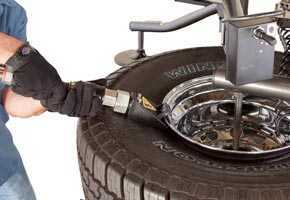 This attention to dtail assures you that your Ranger tire changer will provide years of dependable service. 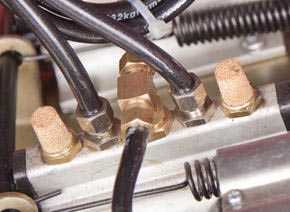 The extrication ports on the valve plungers are muffled so that every time the valve releases, any dirt or debris automatically gets blown away. NextGen tire changers feature foot pedals that are crafted with forged steel instead of cast steel or aluminum so they will hold up to the daily use of a high volume tire shop. 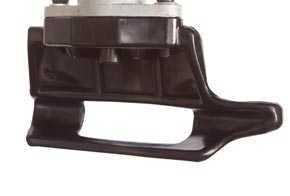 They contain a return spring that compels the pedal to returm smoothly, reliably and with control. 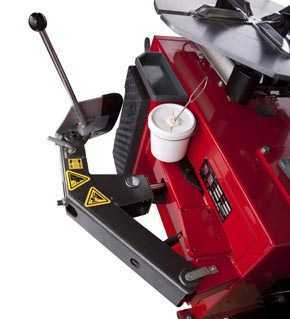 All controls are positioned up front for ease of access and to allow for speedy technician work. 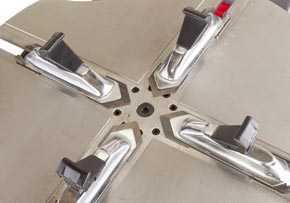 The NextGen tyre machine foot pedals feature control valves with multiple link rod connections so plungers will function smoothly without binding and are controled with precision. All Ranger NextGen tire changers electrical connections, leads switches, motors and vital components are seals air tight to protect them from dust, debris, and contaminants. All air lines , valves and hoses are suitable for high pressure service and are resistant to wear and abrasion and leakage. This is where most inferior machines have their first problem. 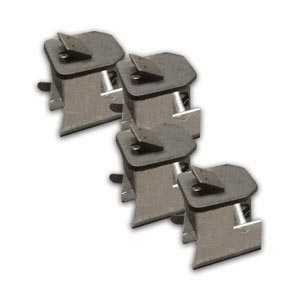 Ranger NextGen tire changer features hardened alloy steel wheel clamps that are easily and quickly replaceable. R23AT, R26AT, R26DT, R80DTXF and RX3040 NextGen tire machines include the power assist arm assembly with innovative drop center tool that allows you to handle thick wall tires or tough low profile tires without fear of damaging them. R23AT, R26AT, R80DTXF and R26DT NextGen tire changers include a mounting helper tower with three flanges and a cast iron frame and maintenance free bearings along with braided steel conduit to protect all the hoses and electric lines from wear or abrasion . 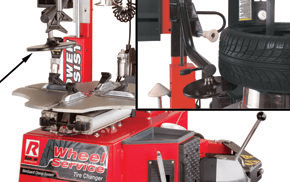 The power assist tower features a slot for the tire iron allowing the mechanic to apply additional leverage if needed for the most difficult thick walled tires. 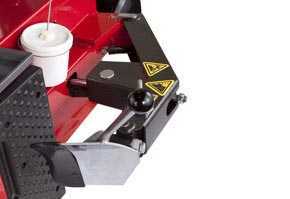 All controls are located up front so as to allow for easy access and speed up the technician's productivity. 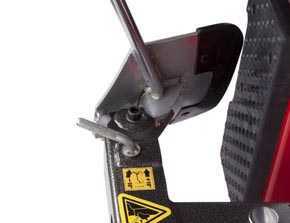 Tire inflation pedal makes inflation easy and hose includes a quick chuck that stays on so technician can keep hands free for other functions. 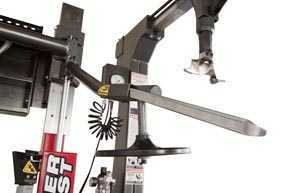 Mounting helper arm articulates for various wheel and tire dimensional configurations. 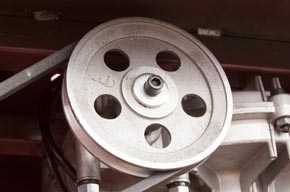 Wheel restraint device assures wheel stays put during inflation process and and device has nylon protection to prevent wheel damage on those expensive rims. 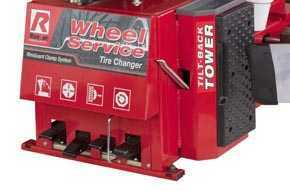 Tilt back tower tire changer models give the user easier access to the wheel for all functions. 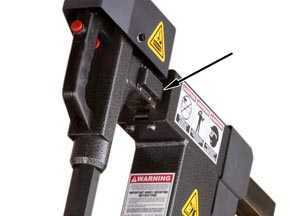 This is a desirable feature that works well with the pneumatic locking tool. 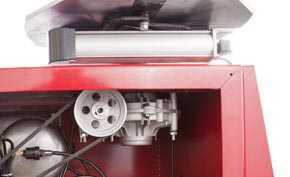 Air cylinders under turntable are composed of stainless steel and aluminum and reduce frequency of vibration extending the life of this valuable machine. 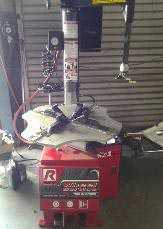 Ranger tire changer models have pistons that feature end of stroke bumpers to protect seals and piston rods and they are permanently lubricated so they are maintenance free. 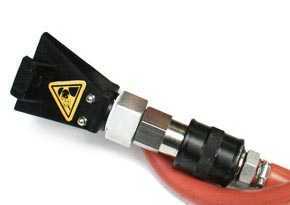 The mounting / demount head is crafted of a hardened alloy steel and it's innovative design means you'll be able to perform all operations without needed to reposition tool head. Tool head is fine and smooth and will glide over tire while performing all functions, ensuring once again that no damage is done to expensive wheels. Don't worry about damaging expensive wheels. This multiple piece wheel protection kit covers all working parts that touch the rim, including the wheel clamps, bead breaker and duckhead. All standard accessories and tools are included, as well as a hardended steel tire iron. 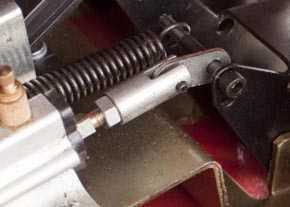 Tool shaft is fabricated out of heavy duty 45 millimeter steel and support arm on the outrigger is hardened steel. 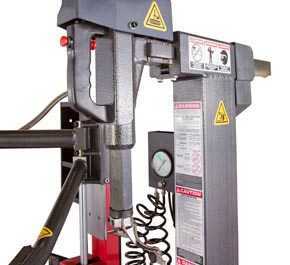 They combine to maintain stable precise position for mounting and dismounting operations. All bearings are maintenance free and the lower roller guide is hardened as well for controlled and smooth functionality. 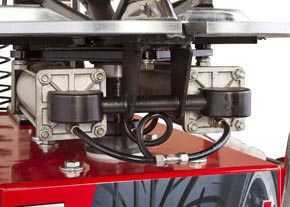 Rubber bumpers prevent shock damage and wear to machine when the tower tilts back on tilt tower models. 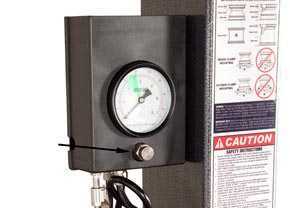 Large 8 gallon jet blast tank is larger than most tire machines, which is typically only 5 gallons. 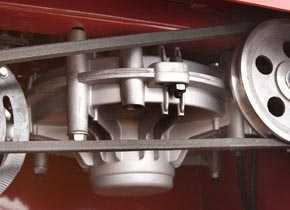 Combine that with the large diameter feeder hose and nozzle, and you will be able to seat the bead of any tire / wheel combo you place on the turntable. Storage for accessories or hand tools keeps your work area clear of objects that get in the way and keeps them nearby where you need them.